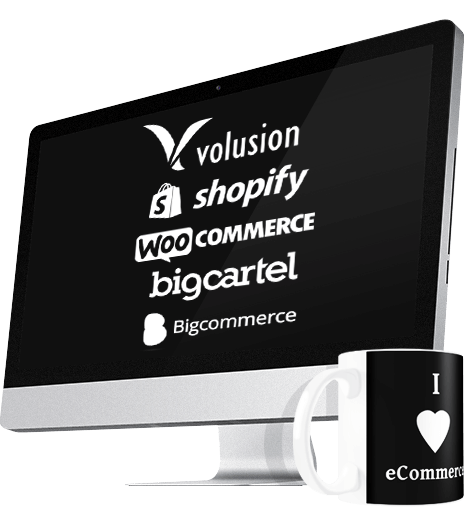 BigCommerce is the software I have used the most and it is a very user-friendly bit of software aimed at the small to medium sized retailer (approximately under 1000 products). You pay for BigCommerce monthly, which some may consider a turn off, but for this you get something that is invaluable for an online store – peace of mind. BigCommerce will protect your site from server downtime and hackers and this security is generally the best thing about a hosted solution. BigCommerce is quite easy to develop for, although I think the finished result can often lack the visual polish of some of the other options on this list. It lends itself well to shops that need a heavily customised appearance. It’s also easy to migrate to BigCommerce from your old shop if you have one. Speaking of visual polish, Shopify is the main rival to BigCommerce in my opinion – not because it is a better overall package but because it is a very beautiful bit of software. Again, it’s a rented store and it’s similarly priced. It lacks some of the options that BigCommerce offers to the shop owner – the admin area is more limited, although as a result it is a bit easier to use. It’s a slightly more lightweight alternative for a small to medium retailer, and although it may not have all the functions of BigCommerce it is extremely well presented. Because of how Shopify is coded it lends itself well to clean, minimal designs with eye-catching slideshows and other effects. Big Cartel is like Shopify’s little brother, it’s attractive and generally used by small retailers who are offering a similarly attractive product. Artists, musicians, etc. Big Cartel does not have anything like the customisability of Big Commerce or Shopify, but it is ideal for people with perhaps no more than 50 products who want to present them in a simple, elegant manner. The admin area is also rather limited, and there are no options like a blog, other other widgets that you get with the larger packages, but for a small retailer I still often recommend it. It’s not easy to develop for, but if you are after a clean, minimal look and don’t need as serious a solution as Shopify it is well worth a look. WooCommerce is the first of the self hosted options that I recommend. It’s not paid for monthy, it’s a free plugin for WordPress and is installed on the same hosting that you have your WordPress site on. The best thing about this is that it is easy to intergrate it into an exisiting WordPress site and it is easy to set up and easy to use. Because it is part of WordPress the transition and intergration between shop and blog (or the other website pages) is seamless. There are limitations though, and the main one is probably that you no longer have the peace of mind of having your shop hosted by a specialist company like BigCommerce or Shopify. As long as you take care of the site security this will not be a problem, but it is something that will need to be monitored. I love WooCommerce for situations where you want to be able to sell a few items from your existing website, but it does have the potential to be more than that, plus it is extremely easy to customise. Magento comes in three different flavours, a free, self hosted solution called Magento Community, a rented solution called Magento Go and an Enterprise edition that is pretty much the last word in software for large retailers. Enterprise is only really necessary if you have a lot of products (say 1000+) or extremely high traffic, and as such it is generally more than most people need. I personally tend not to use Magento much because the Community edition is not very user friendly, and for my money the Go edition is not as good as BigCommerce or Shopify. Rather than suggest one software package over another out of hand, I think it is important to look at what you will need. Each of the options here have strengths and weaknesses and it’s worth spending some time deciding on which will work best for you. I can help by talking over what you need your shop to do and look like, and looking at areas like expansion and marketing as well, and if there is a eCommerce solution you like the look of that isn’t listed here, I can advise you on that too. Plus, if you need help migrating from an existing store, I can do that too.